Engagement photos can be a beautiful way for you and your loved one to share a pivotal moment with family and friends. It’s the perfect opportunity to document the excitement and anticipation of the time leading up to your wedding date. It’s also a great way to showcase how your personalities complement and bring out the best in one another. Capturing authentic emotions on camera can be tricky, but with a bit of planning, you can create original engagement photos that will resonate for decades to come. We’ve compiled some engagement photo shoot tips to help you choose the right location, find a good photographer, and make sure that you and your partner look and feel your best in front of the camera. Choosing engagement photo locations can be the most exciting part of the process. Think of this as an opportunity for the two of you to explore different areas as a vacation, day trip, or weekend getaway. If you plan to travel out of town, make sure to schedule your route, transportation, and lodging ahead of time. It’s a good idea to check for seasonal events that are planned in the area, such as festivals or parades; this could also give you new ideas for the photo shoot. Outdoor settings have inspired some of the best engagement photos. Make sure to choose a location that resonates with you and your lover. If you love to go on hikes together, head into the hills! A beautiful beach backdrop might be perfect for another couple, but if you don’t like the sand, it might be best to stay inland. There’s no need to stick to one specific location. You can take photos at multiple sites, documenting a “day in the life” of you and your loved one. You might accidentally discover something en route to a planned destination that would make for a perfect backdrop for your photos. If you and your spouse-to-be are fans of architecture and design, research unique structures that might provide interesting contrast in the photos. This could include museums, outdoor sculptures, bridges, or historical buildings. Keep in mind the weather, date, and time of day when planning. This will help you choose appropriate outfits, avoid crowds and traffic, and use the sunlight to your advantage. To capture the warm glow of “the golden hour,” plan to have your photos taken within an hour or so after the sun rises in the morning or before it sets at night. If staying close to home is more your speed, that’s fine too. Some of the most authentic engagement photos feature couples in their own homes, in familiar surroundings where they feel at ease. You can take photos seated on the front steps, strolling through the backyard, or curled up in front of a warm fireplace. The most important part of choosing an engagement photo shoot location is finding a place that has meaning to you both. This could entail going back to the place where you initially met, or to the spot where you went on your first date. If you’re planning to go to a specific restaurant or venue, check ahead to confirm the hours of business and inquire if a reservation is needed. When choosing a photographer, it’s important to find a skilled professional who is also a “people-person” and knows how to set couples at ease. If you count photographers among your friends and acquaintances, review their work and consider hiring someone you know. This will allow you to support your friend’s work while increasing the chances of having a smooth rapport during the shoot. Of course, sometimes it’s easier to work with someone with whom you have no personal relationship. You can still use friends and family as a resource by asking if they have a photographer to recommend. If not, a quick search online should turn up some leads for engagement photographers in your area. You can also use a photo site such as Getty Images or Flickr to get ideas of photos you like. Most of these sites will post credits and contact info for the photographers. If you plan to travel outside of your hometown for the shoot, you may want to research photographers who live near the destination area. A local may have insight into unique landmarks that someone visiting for the first time might have missed. 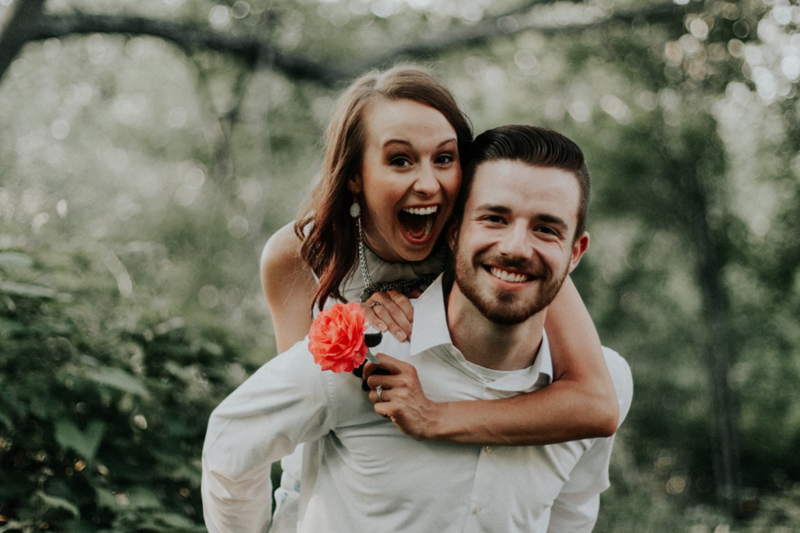 The engagement shoot can also be a great opportunity to get to know your wedding photographer and give them an opportunity to get to know you and your future spouse. Many wedding packages include engagement photos, so you can save money by bundling the services. If you’re hiring a photographer for both the engagement and wedding photos, set up interviews so you can meet face-to-face and ask any questions you may have before signing a contract. For the engagement photos to be genuine, it’s important for both you and your loved one to feel confident and relaxed. This doesn’t have to be expensive. It’s a good idea to have your hair done, and makeup should be taken into consideration; but the important thing is to be comfortable. Wear outfits that look good and complement each other without matching too closely. Avoid bright colors and loud patterns that could potentially be distracting. You’ll want the photos to be timeless, so go for a “classic” look as opposed to something too trendy. If you’re shooting outdoors, wear layers. Stick to clothes that allow for some flexibility and movement. Planning a romantic stroll along a rocky terrain? Leave the high heels at home or bring an extra pair of sneakers or hiking shoes to change into. 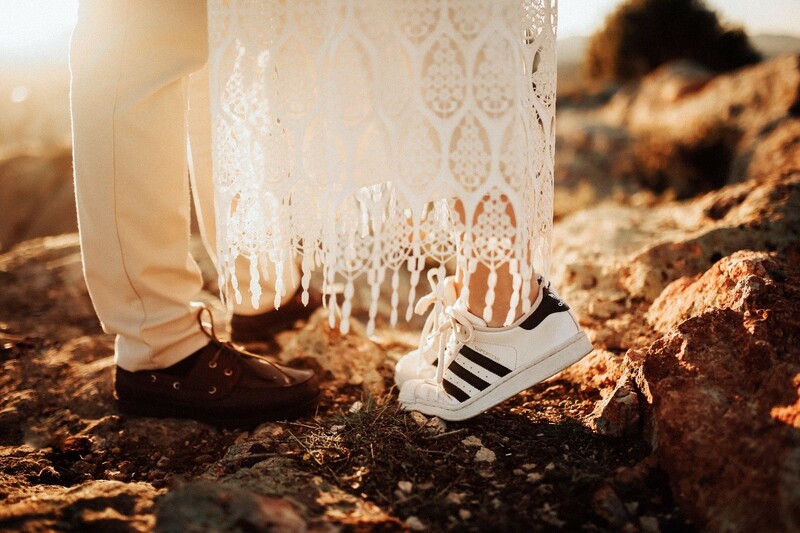 Let your personalities and interests set the tone for the engagement photos. If you’re both sports fans, you can incorporate athletic equipment or outfits into the shoot—or even have the photos taken at an event. If music is your shared passion, you can take a stroll through a record store or use musical instruments as props. Make sure to rehearse any specific poses ahead of time if you’re getting conceptual. Feel free to bring your pets along for the trip! If you have a dog that loves to go on car rides or long walks, they might be happy to join you. Including them in a few shots can add warmth, humor, and spontaneity to your photos. Engagement photos should be fun and romantic, and they should show you and your partner in your element. The more comfortable and at ease you both feel, the more authentic your photos will look. Keep this in mind when researching a location, photographer, and style for your engagement photos. Now that you’ve planned the perfect engagement photo shoot, make sure you’ve found a beautiful engagement ring to offer your loved one. The Diamond Vault carries a wide range of engagement bridal sets to choose from, along with detailed information to help you make the right decision on factors such as color, size, shape, carat weight, and cut. Check out our guide to choosing the perfect ring before you propose.